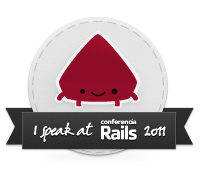 I just realized I still hadn’t published in my blog the slides and video of my talk “La herramienta de desarrollo definitiva” in conferencia rails 2009, back in november. My talk was a reflection about web development and the relative importance of the development tools. I was defending the idea of the individual with good practices being much more important than the choice of a tool or another. I was also talking about why Ruby on Rails is very appealing for such an individual and why it’s still relatively hard to find companies using modern techniques in development. I talked about which were the best practices I consider an “ultimate developer” should embrace, linking it to concepts found in geek literature such as The Mythical Man Month, The Cluetrain Manifesto, Microserfs o The Soul of a New Machine. I just knew the video of my talk about JRuby on Rails at the Sun Open communities Forum is already online. Funny how a google alert let me know this video has been published even before the official web page of the event was updated. The talk is in Spanish and the slides I used are available at slideshare. It was interesting to be at the Sun Open Communities Forum and meet people I used to work with (or even teach to) as back in time as in 1996. It was also interesting to have the opportunity to introduce Ruby and Ruby on Rails to Java developers and show them how they could use it from the familiar JVM. As usual, I uploaded to slideshare the slides I used in my presentation. The layout might be a bit enterprisey for my standards, but I was representing my company, so I used the company template. Anyway, the presentation is under Creative Commons, so feel free to use it in any way you can imagine, as long as you respect the “non commercial attribution share alike” license. I’ve been invited to speak about JRuby on Rails at the Sun Open Communities Forum. This event is the evolution of the former editions of OpenJavaDay/OpenSolarisDay, revamped to include more Open Source communities. Apart from the predictable “all-things-java” sessions, this year there are some interesting labs and talks about MySQL Scalability, REST, AJAX, the cloud, development frameworks and different languages running on the JVM. Most of the talks, including mine, will be delivered in Spanish, but there will be some in English too. Ruby is a dynamic programming language with a focus on simplicity and productivity. Ruby on Rails is a web framework optimized for programmer happiness and sustainable productivity. The JVM is one of the world’s most heavily-optimized pieces of software. The combination of these three elements provides a superb platform for building web applications. In my session I will explain the highlights of Ruby, how Ruby on Rails has changed the rules of web development, and how JRuby allows for the integration of Ruby (on Rails) and Java. Inscription is free and if you cannot attend, there will be live streaming as well. Notice you also have to inscribe (checking the “Lo seguiré por internet” radio button) if you want to watch the streaming. What a fantastic weekend it was. I met interesting people, I learnt a bunch of new tricks, I had fun in the talks (and out of them too! ), and it didn’t rain so we could hang out of the citilab building between sessions. win, win, win. Being a part of the organization it would be inelegant to say how good the event went, so let me just skip that part and go directly to my personal impressions. If I had to provide a one-liner as a summary it would go something like “Everybody was as cool as everybody else.. and that was actually so cool!”. Let me ellaborate on that for a while. We are software developers, and so we are divas at heart (I know I am one for sure). We have attitude, lots of attitude :) Some of us love to be at the spotlight, and others really enjoy to play the chamaleon and blend with the environment… but deep down we all have a lot of attitude and that shows in our disposition to work, in our way of coding, and in so many other things. In the recent bob-against-giles debate, that kind of attitude was referred to as “arrogance” when talking about the smalltalk/C++ guys. Now, don’t get me wrong, I’m all against generalizations -positive ones too- so I will not say everybody in those communities was arrogant. I would say it was a huge minority indeed. But.. the arrogance was there somewhere in those groups. And it is in so many facets of the software world. The rockstar developer myth. And I thought that kind of arrogance existed in the Ruby community -whatever community means anyway- too. And I was proved wrong! There I was hanging around with common people, down to earth, as humble as you get.. and then I was shocked to know those people were actually developers like Mislav with so many world-level plugins, or Aslak contributing to the revolution of testing, or Tomasz doing black magic with code at the rythm of the metal, or Pratik and Xavier working in the shadow so we can get the best documentation ever, or Martha who knows so many things about so many subjects and delivers great presentations, and so many others. Not to mention the great Matsumoto San. I was so surrounded by talent! and I couldn’t see even a single trace of rock star attitude… no looking down, no anything.. just openness and curiosity and a helping hand. And that ROCKS! It’s only two weeks for EuRuKo 2009, the most important Ruby conference in Europe. As you probably know, EuRuKo is a grassroots itinerant conference, entirely organized by -and for- Ruby developers. This year, the conference will be held in Barcelona, and I have the honor of being a -tiny- part of the organization as a member of the Spanish Ruby Users Group, the local group preparing the event. It’s also pretty cool that ASPgems is one of the sponsors. I cannot help but feel a tang of pride (awww, the diva in me ;) ) when I see the commitment and support of the company when it comes to community events. The list of scheduled talks looks promising. Starting with Matz’s keynote there will be sessions about things like cross-platform mobile development, voice-enabled applications, interacting with MIDI instruments from Ruby, Image processing and other non-typical uses of Ruby. They have the sweet scent of EPIC WIN all over. Did you take a look at the list of talks? Any familiar names? Well.. yours truly’s talk proposal was accepted and I’ll be speaking about game development using Ruby and Gosu. How cool is that? I’ve been speaking at other technical events before, and I have a good deal of experience in training, but this will be the first time I do this in English. I’m sure it’s going to be an enriching personal experience. I’m looking forward to seeing you all there. a) Lo de menos son las charlas (aunque sigue siendo importante que, si las hay, sean interesantes). Lo que importa es el ambiente que se genera alrededor . Creo que el futuro de los eventos de desarrollo va por menos charlas, o por charlas filosóficas. b) Tener un nombre en la comunidad no garantiza que seas competente haciendo presentaciones. Lo que sí garantiza es que te aplaudirán digas lo que digas (o leas lo que leas, aunque lleve años publicado y no tenga ningún interés). c) El feedback positivo en una conferencia será directamente proporcional a la gente que venga de otros países. Se ve que la cortesía hace que evalúes bien aunque cometas el suicidio de no tener wifi en un sitio lleno de geeks, haya pocos enchufes, y des un catering de todo a 100. – Server to server communication using XMPP and Ruby, por George Palmer. Dar una charla de XMPP sin hablar de XMPP y sin estar seguro de las siglas tiene su mérito. Dar una charla de 45 minutos en 20 tiene su mérito. Jactarse de no haberse leído un manual de 108 páginas porque es demasiado grande y luego no saber contestar a ninguna pregunta diciendo “pues esto estaría bien que lo hiciera, pero no sé si lo lleva”, tiene su mérito. Y a pesar de todo el FAIL no es absoluto porque la puesta en escena y la presentación multimedia me gustaron. Salvado por las slides de ser un EPIC FAIL. A pesar de que el nivel de las charlas no me pareció óptimo y de que varios detalles de organización me parecieron muy malos (como que se llame “scotland on rails” y luego se quejen de que está demasiado orientada a Rails), el balance general que me llevo de la conferencia es bueno. p.s. gracias a aspgems por el detalle de hacerse cargo de mi viaje. La idea es sacar partido de que vamos a estar juntos más de 200 personas que trabajamos todos los días con Rails, para poder extraer algo de conocimiento colectivo de la comunidad. Lo que pretendo hacer con esta charla es obtener una lista actualizada de los plugins/gemas/librerías varias que a día de hoy preferimos los desarrolladores Rails a la hora de empezar un proyecto y porqué. Para que la sesión sea lo más interesante posible, no quiero hacer yo la lista de librerías a evaluar, ni quiero sacarla de sitios algo desactualizados como la toolbox de working with rails, sino que prefiero que sea un reflejo de lo que realmente usamos a día de hoy para desarrollar. Para facilitar en lo posible la recopilación de librerías, enviadme vuestras listas a jramirez+hotornot@aspgems.com. No seáis vaguetes y enviadme algo… así la charla será más interesante… y, ya puestos, como la conferencia empieza el 13 de noviembre, intentad enviarme la lista antes de que acabe octubre para que me dé tiempo a prepararla. Publicaré el resultado de las votaciones en este mismo blog unos días después de la conferencia. Así podemos sacar todos partido. Después de unos meses de silencio por overflow de actividades extraescolares, voy a intentar retomar el blog… aunque veremos lo que dura porque dentro de un par de días empiezo a dar clases otra vez. Aprovecho la ocasión para anunciar la creación de madrid-rb, el grupo de ruby de madrid. Queremos organizarnos un poco y retomar las quedadas que se hacían hace tiempo, pero dándoles un carácter mensual. En concreto el último jueves de cada mes. La primera cita es este mismo jueves, a las 19:30, en el Starbucks de la calle Génova 4 en madrid. El grupo se está organizando a través de este grupo de google. Además también tenemos un grupo creado en working with rails. Y, lo anunciaré en la quedada del jueves, pero lo voy dejando ya por aquí, me han aprobado un proyecto en rubyforge para que podamos dejar el código que vayamos haciendo. Como puedes subir tus páginas estáticas y rubyforge mola, llevo idea de proponerlo para subir la home del grupo ahí. Si no quieres perderte ninguna cita, hay disponible un calendario al que te puedes suscribir.